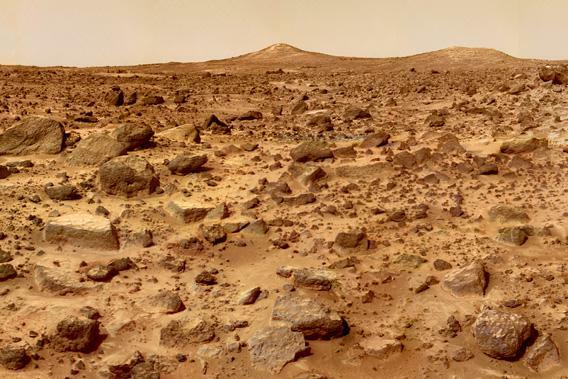 Mars colonization may require Earth soil. We can leave Earth. But will we always have to bring it with us? Eighty thousand people recently applied for a trip to Mars, an excursion that will allegedly be funded by selling reality-TV show rights for the voyage. The company running this curious venture, Mars One, estimates that the price tag for an expedition of four astronauts—currently slotted for 2023—would be $6 billion. But the ticket’s one-way: There is no budget for bringing them back. It wouldn’t be a suicide mission, though. The travelers would be going as homesteaders, intending to make Mars their permanent home. If you’re going to have permanent colonies, say boosters of the idea, you might as well do it from the start. It is not clear whether such a journey could be done safely for $6 billion, or at all. The hazards are numerous. Voyages to Mars will take anywhere between four and 10 months, depending on how much fuel you use. The lack of gravity will make the astronauts’ bones more brittle and prone to breakage. Zero gravity also changes the shape of the eye, harming some astronauts’ vision for reasons that are not fully understood—and in some cases, the changes appear to be permanent. But that’s just the start. Mars itself will be fantastically dangerous. The surface is bathed in solar and cosmic radiation. The temperature rarely gets above freezing. There’s omnipresent dust with toxic chemicals in it. There’s a total lack of breathable air. And if you have a serious medical problem, the nearest emergency room will be at least 34 million miles away. But there’s another, more subtle hazard of Martian homesteading that people have barely begun to think about: the lack of soil. It may be hard to keep people healthy in the long term on Mars without Earth-made soil. Lots of it. During the Humans to Mars conference held in Washington, D.C., in May, several panelists suggested that colonists would grow food hydroponically, in water. That seems logical: Shipping soil from Earth would be expensive, and we’d have to assume until proved otherwise that using Martian soil would be dangerous, because it has a different chemistry than Earth’s. (For example, it has perchlorates, chlorine-based salts that are known to harm the thyroid.) So for the foreseeable future on Mars, hydroponics seems to be the way to go. You can grow a reasonably good tomato in water. But soil is a whole ecosystem, containing bacteria, protozoa, nematodes, insects, and much more—and it supports us in many ways. For one thing, soil bacteria appear to be important for maintaining the proper diversity and balance of microbiota (i.e., bacteria) in the human gut. Scientists say that the bacteria and tiny insects in soil provide ecosystem services to humans and everything else on the planet. They break down the dead and the discarded, purify water, and cycle carbon dioxide into and out of the atmosphere. Justin Sonnenburg, a microbiologist at Stanford, says that soil bacteria also enhance the quality of the foods grown in it. For instance, some of the microbes attack the plants. That may sound like a bad thing, but in fighting off those assaults, the plants generate compounds that are beneficial to human health, such as antioxidants. What it comes down to is this: Among other functions, good soil has bad bacteria that make plants do good things. We may be able to replicate some of these functions with technology, but if we don’t know all of the things that soil does, we may miss something important. Martian colonists could probably live for years on food grown without soil. The question is, could they live on it for decades? Could their children grow up on it? Are there hidden hazards that would not become apparent until much later? To put these questions another way: Can we identify and reproduce the ecosystem services of Earth for a lifetime? Surprisingly, we may already know what some of the long-term health hazards are, and they’re alarming. Microbiologists are linking decreases in gut biodiversity to Western diseases such as allergies, asthma, irritable bowel syndrome, and colon cancer. Says Sonnenburg, “[I]n the Western world, we’re living an existence that is somewhat Mars-like in being foreign to humans.” Permanent residents of Mars, and their Mars-born children, could be even more afflicted with these problems than people on Earth. Mars may be both too dirty—in the sense of having toxic dust—and too clean. Just getting to Mars could throw the bacterial balance of arriving colonists out of whack. Space does odd things to bacteria. According to Hernan Lorenzi, a biologist at the J. Craig Venter Institute, nasty bacteria like salmonella and pseudomonas become even more virulent when grown in Petri dishes in weightlessness. But what happens inside weightless people? Forty years of research has shown that astronauts’ gut bacteria change during long missions. The studies have been limited, though, because most bugs in the gut can’t be cultured for study. Lorenzi is using newly developed gene-sequencing machines that can identify everything in samples donated by astronauts, whether it’s culturable or not. If he finds a loss of biodiversity and an increase in dangerous bacteria, it will not be surprising. To be sure, health hazards are inevitable in exploration. Sailors on long voyages suffered from scurvy until captains learned to stow limes and other foods rich in vitamin C. But wherever those sailors went, they were still in an ecosystem. For that matter, astronauts in Earth orbit still get regular shipments of food from Earth. On Mars, none of that will apply. Colonists on Mars will be pioneering a long-term experiment in human health away from the ecosystem services of Earth. Could Earth just ship thousands of pounds of good solid Kentucky dirt to Mars, and to hell with the cost? That wouldn’t necessarily solve the problem. Sonnenburg says that unless you can properly maintain a soil ecosystem, which is hard to do in a closed environment, its biodiversity will decrease. Its tendency will be to ratchet down, he says, and once that starts, it’s hard to stop. Until those problems are solved, the best solution may be to send food from Earth to supplement what the colonists manage to grow on Mars. The idea is to get the colonists eating a non-Western diet, with lots of vegetables and fermented foods like yogurt, sauerkraut, kefir, and kimchi. Such foods are laden with healthy bacteria. Customized probiotic pills might also help, if they can be shown to work. That’s going to make for an expensive cup of yogurt, though. Commercial space companies such as SpaceX are aiming to get launch costs down to a mere $1,000 per pound, and that’s not even counting additional postage to Mars. Still, Sonnenburg strikes a note of optimism. If you treat Martian colonists right, he says, their gut bacteria could end up in better shape than those of most Westerners here on Earth. But it’s hard to imagine that canned food and pills—whose microbial quality could decrease after months in transit—will replace all of the ecosystem services we get from Earth. In his recent novel 2312, the science fiction author Kim Stanley Robinson suggests that space colonists will have to return to Earth every seven years to replenish their internal microbiota. Robinson has thought more deeply about long-term space habitation than any other science fiction writer, stocking his novels with pages of exposition on how to create healthy bacterial ecologies on terraformed planets and hollowed-out asteroids. But even 300 years from now, Robinson suggests in 2312, we still won’t fully understand the microbial genius of Earth. We will be able to leave it. But maybe not forever.